How could I selectively recover deleted iMessages from iPhone? Hi all, I deleted a 1-year iMessage thread accidentally. I need to get it back urgently. About a week ago I synced my iPhone with iTunes on my Mac. How can I retrieve that thread? By the way, I don't want to restore my iPhone, I only want iMessages back. Any suggestion? It's actually very easy, as you've said that you synced your iPhone with iTunes on your computer recently. You know, everything on your iPhone has been automatically backed up by iTunes when you sync devices with it, though you can't view the backup file, nor only restore the iMessage content from it. However, with a third-party iPhone iMessage recovery tool, you can do it. Of course, if you don't have a backup, you still can choose to scan and recover it directly from your iPhone. There is always a way. 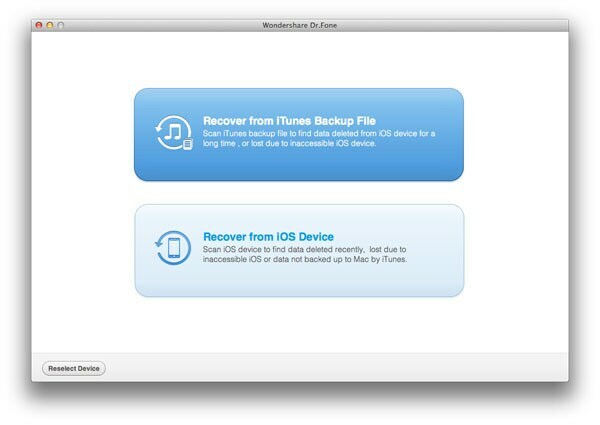 As to the recovery tool, here is my recommendation: Wondershare Dr.Fone for iOS Mac (for Mac users) or Wondershare Dr.Fone for iOS (for Windows users). Both of them allow you to extract iTunes backup files, preview and recover deleted iMessages selectively. 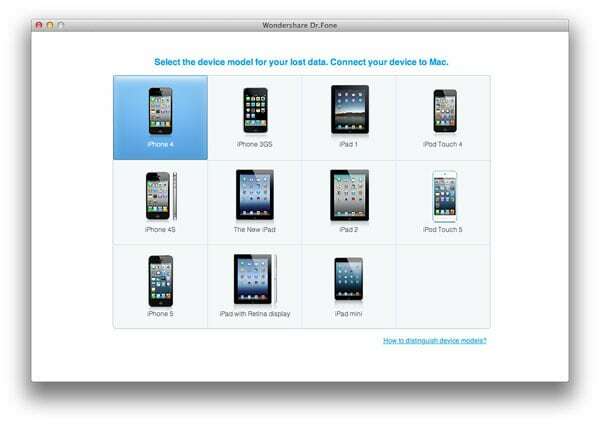 Moreover, Wondershare Dr.Fone lets you directly scan your iPhone to recover iMessages, which is great. 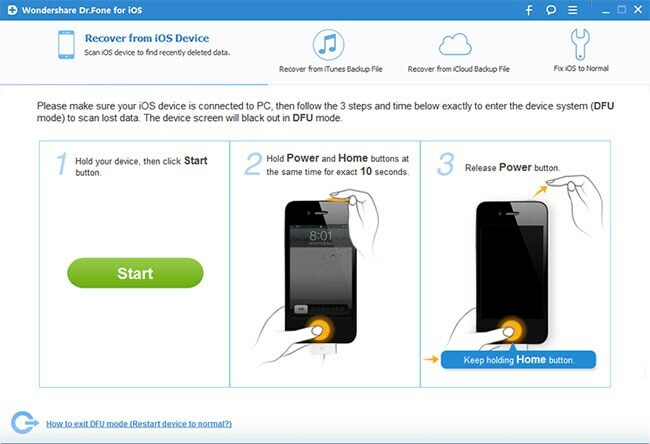 Download the trial version of iPhone data recovery program below and then you can install it on your computer. Next, let's perform deleted iPhone iMessage recovery with Wondershare Dr.Fone (Mac) in steps. 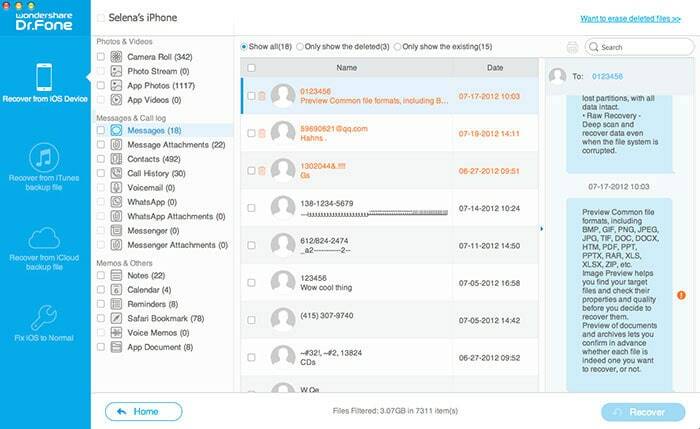 The window below is the primary window of Wondershare Dr.Fone Mac. You'll get it after running it on your computer. Just click the phone type of yours. Here we choose iPhone 4 to carry on. There are two ways for you to recover iMessages from your iPhone. One is to extract your iTunes backup file, and the other is directly scan your iPhone. Advice: If you have synced your iPhone with iTunes recently (before you deleted your iMessages), you can choose the former. If you haven't, switch to the latter. 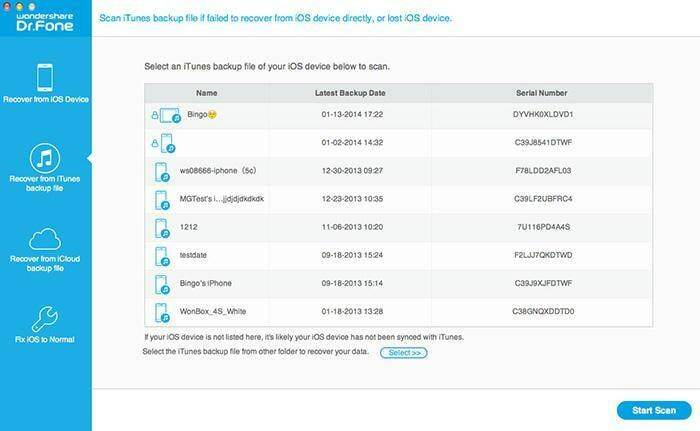 All backup files of your device type will be listed automatically after you enter this recovery mode. Choose the one for your iPhone (usually the one with latest backup date if there are more than one), and click "Start Scan" to begin extracting it for your iMessage. When the extracting completes, the whole content of the backup file are displayed in details. Select "Messages" on the left side on the window, and you can preview detailed contents of your messages and iMessage. Mark those you want to recover and click "Recover" button on the top of the window, you can save them on your computer with one simple click. Hold your device and click the “Start” button. Hold “Power” and “Home” buttons on your device at the same time for exact 10 seconds. When 10 seconds passed, release the “Power” button right away, but keep holding the “Home” button. After another 15 seconds, you’ll be informed that you’ve successfully entered the device system and you can release the “Home” button now. Note: Your iPhone will be in a black status. It's normal. Just move on. 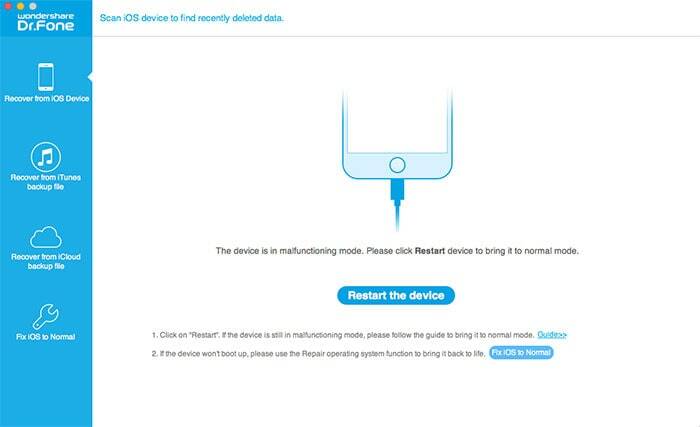 If you want to discard and get your iPhone back to normal, you can click "Restart Device to Normal". Just as the last step in the recovery mode above. it's the time to preview and check your previous data now. Just check one by one and click "Recover" to save them on your Mac.